Trinbago Knight Riders held off a strong challenge from the Barbados Tridents to secure a crucial victory. 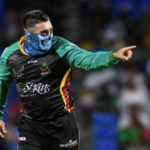 Tabraiz Shamsi returned stunning figures of 2-16 in four overs in his first CPL outing. Martin Guptill’s 73 was in vain as Jamaica Tallawahs beat Barbados Tridents by five wickets. The Trinbago Knight Riders romped home against the Barbados Tridents with time to spare. The St Kitts & Nevis Patriots earned a comfortable six-wicket victory over Barbados Tridents. 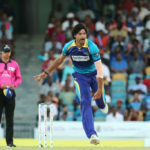 Giant paceman Mohammad Irfan recorded the greatest ever spell of T20 bowling in history. Kieron Pollard scored his first T20 century to set up up a 38-run win for the Stars. Our CPL Play of the Day goes to Ahmed Shehzad, AB de Villiers’ replacement at the Barbados Tridents, for his excellent catch. 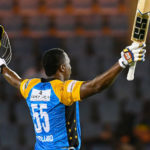 David Miller hit the winning runs as the St Lucia Zouks beat the Barbados Tridents in the Caribbean Premier League on Saturday. Dale Steyn continued his excellent form in the CPL with 4-27 in the Jamaica Tallawahs’ 36-run win against the Barbados Tridents. 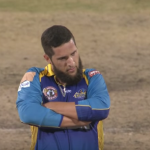 Wayne Parnell is enjoying his time with the Barbados Tridents in the CPL. 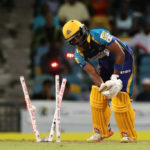 AB de Villiers shared a 68-run partnership in six overs with Nicholas Pooran to set the Barbados Tridents on their way to victory in the CPL. 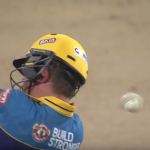 The CPL Play of the Day goes to AB de Villiers, for getting smacked on the helmet, before smacking a six the very next delivery. 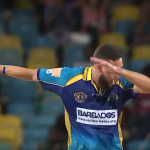 Wayne Parnell shows off his dance moves after taking a wicket for the Barbados Tridents on Wednesday night.